Bargello quilt tops have been showing up in the Elm Street Quilts Facebook page. Credit in above photo to (starting from the top) Laraine, Laura, Jen, Terry & Alida. Miss any of the QAL posts? Find the full list here. The linky party is now open. You can link up a photo of a bargello - whether you've quilted it or not! You get an entry for each of the bargellos you made during the QAL - made 2? Two entries! Seriously addicted and made a third? 3 entries for you! If you don't have a blog or have trouble uploading a photo, just email it to me at elmstreetquilts at gmail dot com and I'll enter it for you! Prizes will be randomly awarded to three participants who enter a bargello - quilted or not - into the linky party or send me an email. All entries linked (or received via email) by 11:59pm on April 22 are eligible! I've had so much fun with the QAL and each time I see a bargello on instagram or Facebook, I just grin. They all look wonderful! American Made Brand solids, one of my blog sponsors, has a collection of 75 beautiful colors of fabric completely manufactured in the United States - from the cotton to the finished fabric! The fabric has deep rich color and I love the feel of the fabric (the hand.) My large Bargello was made exclusively of American Made Brand solids from my stash. American Made Brand is providing two fat quarter bundles of these beautiful colors. Fat Quarter Shop, one of my blog sponsors, offers a tremendous selection of fabric and very beautiful (and tempting!) block of the month offerings. Fat Quarter Shop offers fabric from many different manufacturers and you can find anything you are looking for there! Fat Quarter Shop is providing a fat quarter bundle of Riley Blake Small Gingham. Share your progress on your blog, via Instagram - use #elmstreetquilts and #bargello as our social tags. 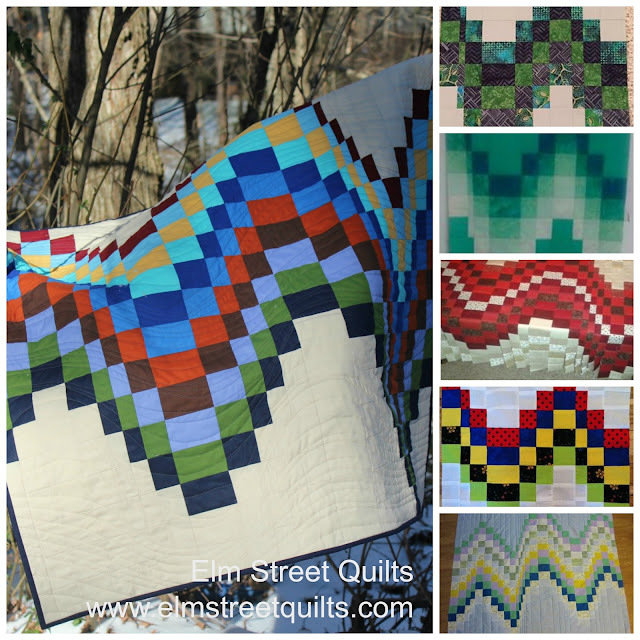 Join the new Elm Street Quilts QAL Facebook group and share your progress! It has been so much fun to see the bargellos progressing!. My thanks to the wonderful people at American Made Brand for sponsoring this Bargello QAL. NICE TO SEE ALL OF THE PROJECTS MADE. THANKS SO MUCH FOR THE INSTRUCTION IN HOW TO MAKE A BARGELLO.